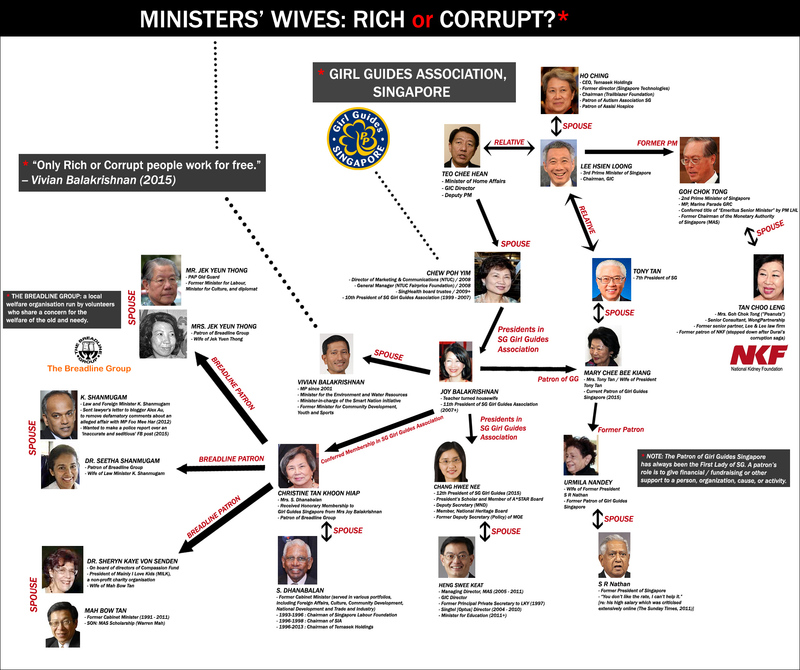 Ministers’ Wives: Rich or Corrupt? Thanks to various readers/netizens for contributing to this post. a) Teo Chee Hean’s wife is Chew Poh Yim (“Mrs. Teo Poh Yim”). 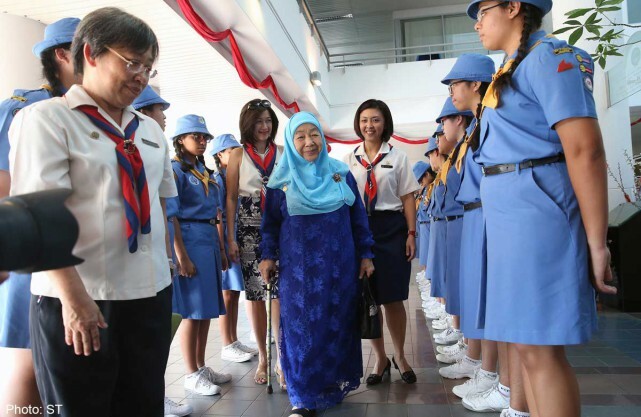 Chew Poh Yim was the 10th President of Girl Guides in Singapore. 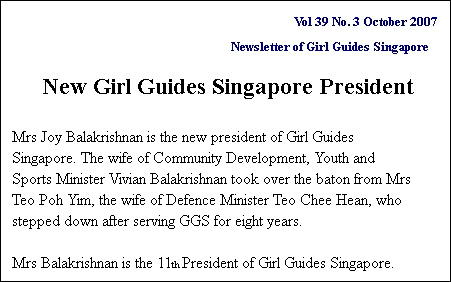 b) Joy Balakrishnan, wife of Vivian Balakrishnan, is the 11th President of Singapore Girl Guides Association. She is a teacher turned housewife. c) Mrs. Christine Dhanabalan, wife of former cabinet minister S. Dhanabalan, received an Honorary Membership to Girl Guides Association from Mrs. Joy Balakrishnan. d) According to AsiaOne and GirlGuides.org.sg, Ms Chang Hwee Nee took over from 11th President, Mrs. Joy Balakrishnan, whose term of office ended on 30 May 2015. Chang Hwee Nee is the wife of Education Minister Heng Swee Keat. e) The patron of Girl Guides (in Singapore) has always been the First Lady (wife of the President). “Patrons” generally refers to well known or illustrious individuals who lend their name and support to an organisation. GGS President, Mrs Joy Balakrishnan, presenting Mrs Nathan with the Long Service Award. 2011. On 12 November 2011, Mrs S R Nathan, former Patron of Girl Guides Singapore (GGS), received the Asia Pacific Region (APR) Appreciation Award. Mrs Nathan was also presented with the Long Service Award for her 12 years of dedication and invaluable support to the Girl Guiding movement. Girl Guides Singapore is registered as a Charity with the National Council of Social Services (NCSS). Girlguiding is a charitable organisation and adult leaders are not paid for their time. 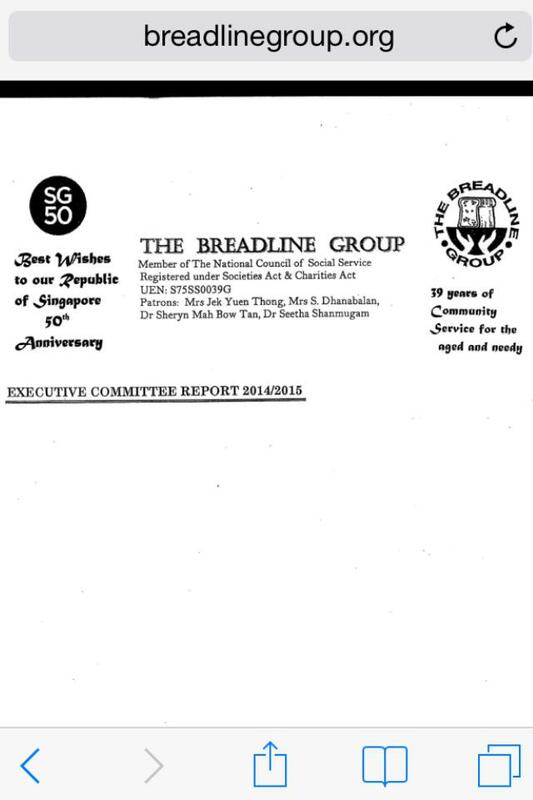 Breadline Patrons (Executive Committee Report: 2014/2015). a) Breadline is run by Richard Lim, with the minimum of overheads – eg no office. Richard dedicates many hours to his work on a voluntary basis. The Breadline Group is a community service comprising of volunteers. It was formed because we share a concern for the welfare of the old and needy in Singapore, and want to channel our efforts towards helping them. b) Patrons are mentioned as Mrs. Jek Yuen Thong, Mrs. S. Dhanabalan, Dr. Sheryn Mah Bow Tan, and Dr. Seetha Shanmugam. c) Jek Yuen Thong was the former Minister for Labour and Minister for Culture. He was part of the People’s Action Party’s Old Guard of politicians. d) Christine Tan Khoon Hiap is the wife of former cabinet minister S. Dhanabalan. e) Dr. Seetha Shanmugam, a Berkeley-educated, Chicago-trained clinical psychologist (not a foreign talent), is the wife of Law and Foreign Minister K. Shanmugam. Minister K. Shanmugam was previously married to Jothie Rajah, the daughter of K. S. Rajah, former Judicial Commissioner of the Supreme Court of Singapore. Jothie Rajah’s critical book on SG legal system, published in 2012. 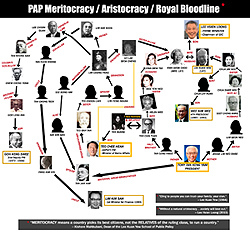 Shanmugam’s marriage to Dr Jothie Rajah failed and they divorced after 15 years, due to “mutual incompatibility.” In 2012, Dr Jothie Rajah wrote Authoritarian Rule Of Law, a critical text which alleges that the rule of law is a subjugating rather than liberalising force in Singapore. Shanmugam said he had not read the book. In 2012, Shanmugam sent a lawyer’s letter to blogger Alex Au to remove “defamotary comments” with regard to an alleged affair with MP Foo Mee Har. As yet, no lawyer’s letter has been sent to U.S.-based lawyer Gopalan Nair, whose blog post contains a detailed comment on Shanmugam’s “affair with a Chinese colleague” while working in Allen and Gledhill law firm (where Shanmugam was formerly a senior partner). In 2015, Shanmugam wanted to make a police report over an “inaccurate and seditious” Facebook post. Sheryn Mah profile on SG Tatler. f) Sheryn Mah, wife of Mah Bow Tan, sits on the board of directors of Compassion Fund and is the president of Mainly I Love Kids (MILK), a non-profit charity organisation providing aid to disadvantaged children. The organisation’s signboard in front of NKFS headquarter in Kim Keat Road was vandalised after the scandal broke out. Image from Wikipedia. Tan Choo Leng and T T Durai. Ho Ching, wife of PM Lee Hsien Loong. Mrs. Goh Chok Tong had previously supported Durai. says Everything that one needs to know about the character of the person who made it. Need more be said ? The fornicatory relations of the ruling class, both in bed and out of bed, have imparted a stench to Singapore which has proved to be more lingering that the most serious Indonesian haze that blew into this land of ours. Only rich or corrupt work for free ?? Then what about VOLUNTEERS and humble people all over over the world who did genuine services for people in need. Why can’t a NORMAL man provide services in free to the people in need ? ?